Surviving Chemistry AP Exam 2014 - 2015. 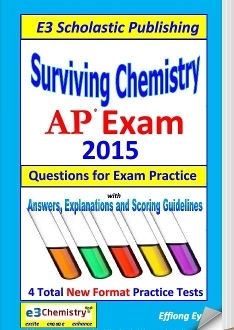 Completely revised to fit the new AP Chemistry question, testing and scoring formats.
. 14 Days of Practice Question sets.
. Easy-to-use Scoring Guidelines to all Free Response questions.
. Clean, simplified and easy-to-understand answers with clean, clear explanations.
. Over 20 PES, mass spec and analysis questions.
. Over 100 questions based on graphs, diagrams and tables.
. A question or more for just about every Learning Objective. We took our time to remove, revise, and/or replace over 90% of the questions from our 2013 Edition. Also available as a digital eBook.